Locality: At Bukov and Predborice, Czechoslovakia. Link to MinDat.org Location Data. Name Origin: Named for Jaroslav Hak, mineralogist, Institute of Ore Research, Kutna Hora, Czechoslovakia. 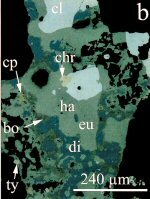 Comments: Polished section showing chrisstanleyite (chr) is present as a single grain intergrown with clausthalite (cl) and eucairite (eu). cp (chalcopyrite), ha (hakite), di (selenian digenite), bo (bornite). (CanMin, v43:689). Location: Low-temperature selenium-rich assemblage at Predborice, Czech Republic. Scale: See Image. Comments: Polished Section image of giraudite-hakite (gir-hak) with berzelianite (bzl ) and galena (gln). (CanMin, v40:1161). Location: Niederschlema-Alberoda uranium deposit, Erzgebirge, Germany. Scale: See Image. RL Color: Creamy white to clear brown. note: Specific Gravity of Hakite =6.26 gm/cc. U=PEHakite x rElectron Density=1,993.62 barns/cc.